Hiding in the shadows is a metal studded door. 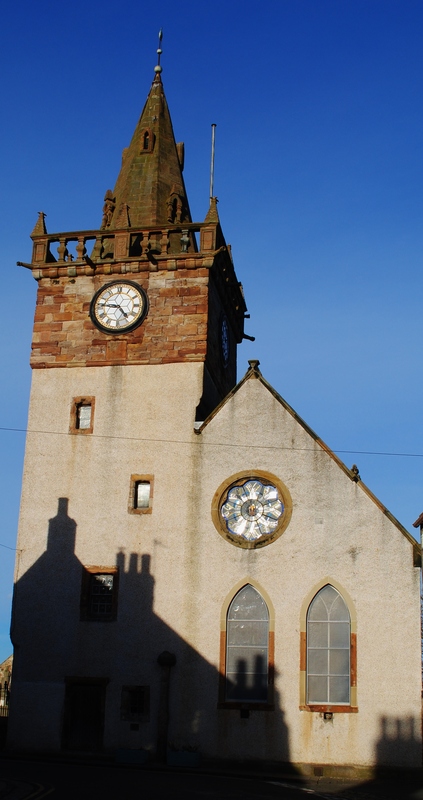 It is located on the west face of Pittenweem Tolbooth Steeple, Fife. A building which dates back to the late 16th century and according to Stell (1982) it is one of only 20 tolbooths in Scotland which date to before 1707. 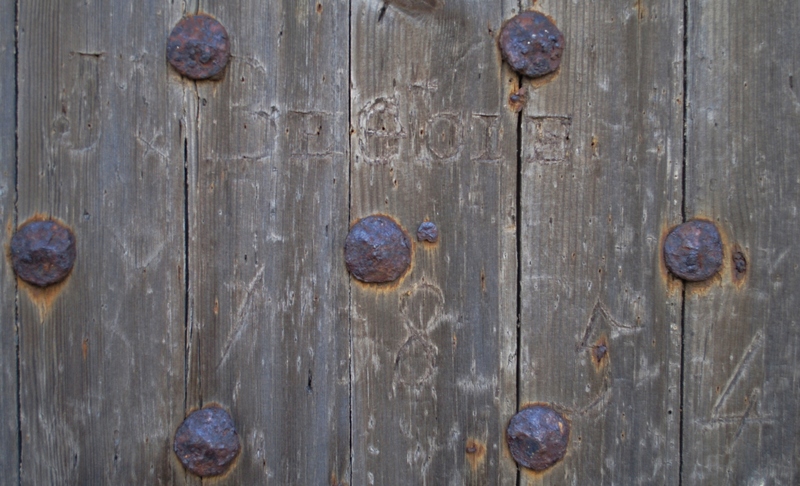 I was drawn to the door due to its old and weathered character but was soon attracted by letters scratched on its surface. At one point is the date 1829. I am not sure, why these dates have been singled out. And, if I am reading it correctly, who was J BeGole. Did they live in Pittenweem? Or was this a clandestine act of a traveler, perhaps only in the harbour for a matter of hours? 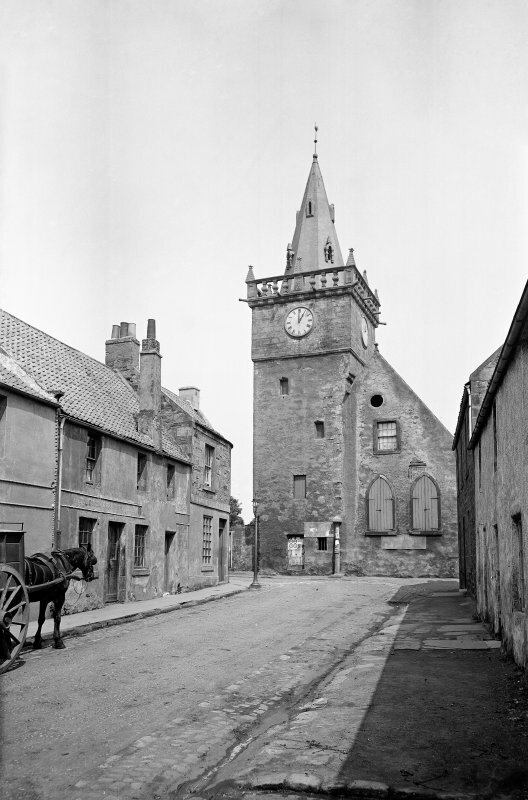 Subsequently, some rapid research, produced a photo on RCAHMS of the Tolbooth, taken in 1882 (at 1 pm) by archaeologist Erskine Beveridge. Beveridge had been born in Dunfermline in 1851, three years before J BeGole was scratched on the Tolbooth door. and separated by only 28 years, did it resonate with any meaning to him? I assume Beveridge would have realised that the door led into the jail cells within the Tolbooth. If so, he may also have been aware of the stories of those who were locked in the cells in the late 17th and early 18th centuries. The RCAHMS records make no reference to this, while the Places of Workship record largely focuses on architectural details. 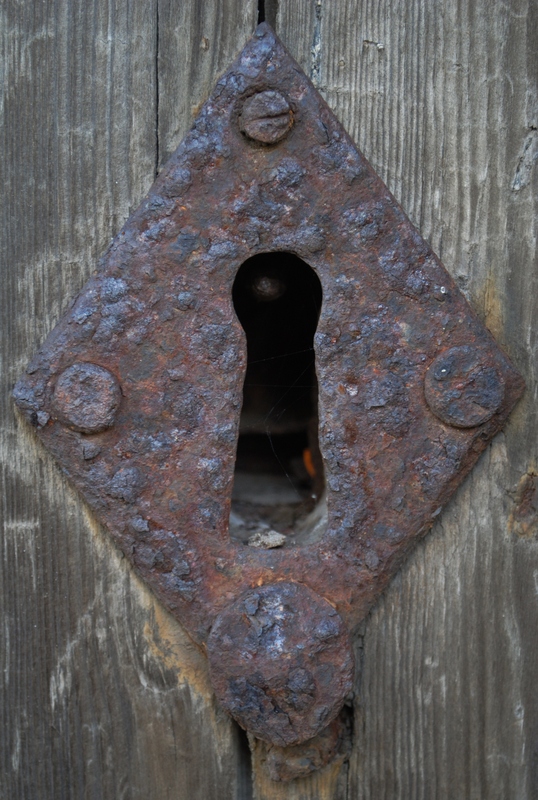 and subject to torture : behind the Door of Secrets. I have not had time, yet, to find details of primary sources relating to these stories and their veracity. However, it is clear that there is a horrific account of what may have happened. Additionally it appears that in 2012 there was vote in the community as whether to erect a memorial to those accused of witchcraft who had suffered. As always, knowledge and meaning of the past, is partial and diverse: some know of archaeology, history and heritage, some wish to remember and some wish to forget. 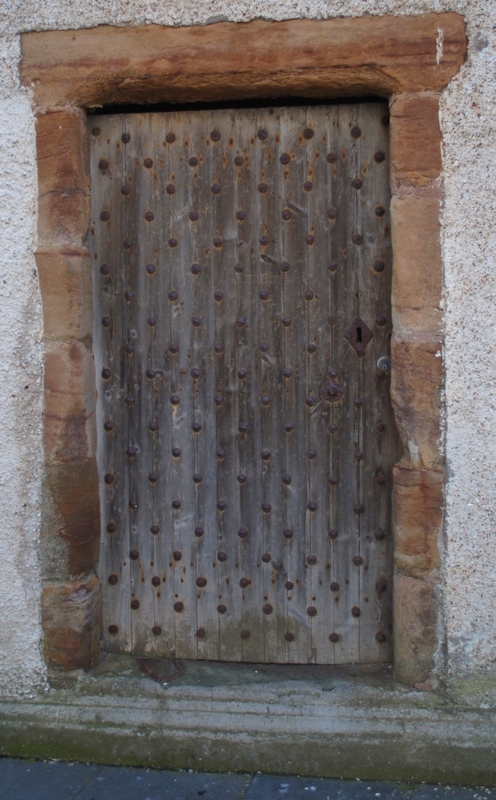 It would be greatly appreciated, if anybody has any further information, or suggestions as to the associations or meanings of the dates and name on the door of secrets dating to the 19th century. Stell, G 1982 ‘The earliest tolbooths: a preliminary account‘, Proc Soc Antiq Scot 111, 445-453. I have been reflecting over the past few months on the Power of the Picts. No I am not referring to the 1969 album ‘Power of the Picts’ by Writing on the Wall. 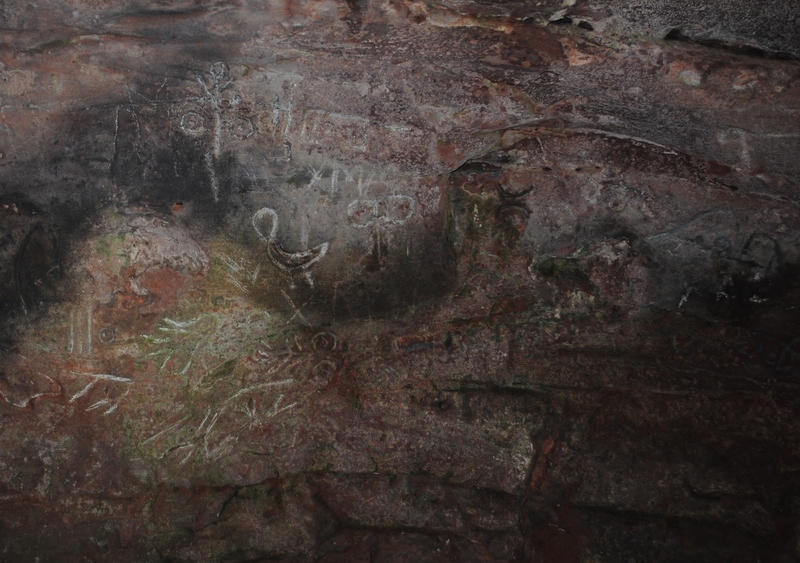 Rather on a visit to the recent laser scanning of Johnathan’s Cave as part of the Visualising Wemyss Caves Project I was reminded of the rich artistic legacy which has been left by the Picts and its continued ability to inspire creative responses. 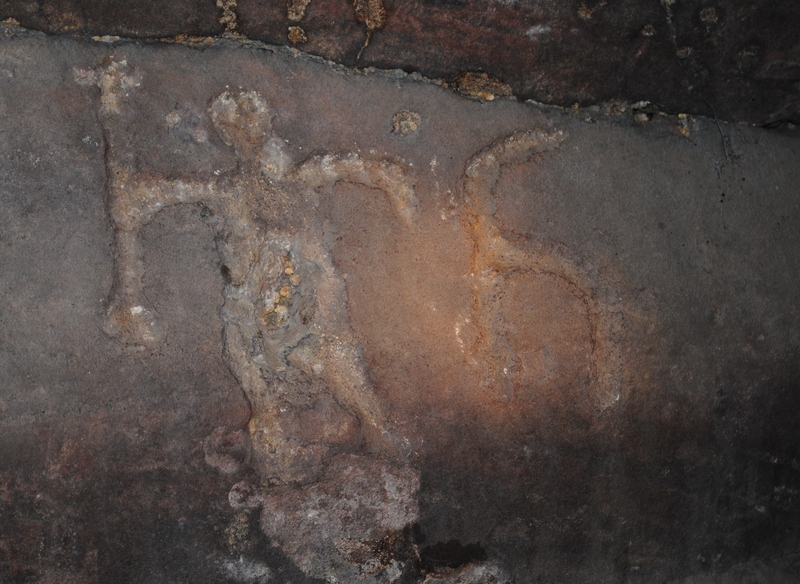 The caves at East Wemyss, Fife, have a range of Pictish carvings dating to c AD 300 to 800. These include a series of familiar motifs, including abstract symbols such as double discs and z-rods. There are also more figurative forms of animals including fish, birds and beasts embellishing the walls. The potent orders of sea, sky and earth combined in the otherworldly darkness of the cave. I must confess it was not these carvings, in the first instance, which started this line of thought. Rather I had the opportunity to purchase (for a very reasonable price) a tea towel adorned with Pictish Symbols from Wemyss Caves. I was informed that the piece has been undertaken in support of Save Wemyss Ancient Caves Society (SWACS) in 1999 by the artist Marianna Lines. The work of Marianna Lines has involved a technique using natural dyes to produce images directly from Pictish and other stone carvings: she can be seen speaking to comedian / presenter Craig Ferguson in a (long forgotten?) Pictish themed episode of the Dirt Detective ‘Artists with Attitude‘. As I was thinking about this, I was reminded of another manifestation of the Power of the Picts, I saw nearly ten years ago in a suburban garden. 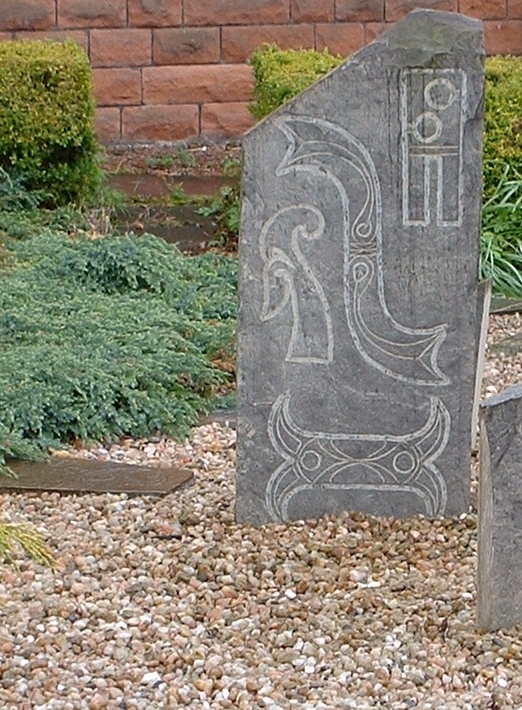 The Power of the Picts had inspired somebody to carve symbols on stones and arrange them in the form of a stone circle. Evoking perhaps (? unintentionally) the relationship expressed in the early Historic period, where there was often a reuse of earlier prehistoric sites. The remarkable Hilton of Cadboll Stone, with exquisite carving in c AD 800 and extended biography: toppled in the 17th century; the carving on the back face was chipped off and commemorative inscription to Alexander Duff and three wives was added; moved to the grounds of Invergordon Castle in 1860; then to the British Museum in 1921; and rapidly returned to Scotland. With a copy being produced in 1998 by sculptor Barry Grove to be placed at the original location. To a broken slab found from a Fife hilltop not far from East Wemyss: one of my earliest memories of learning about Pictish art was when Professor Leslie Alcock took a class to the top of East Lomond Hill and explained that a fragmentary carving of an ox or bullock had been discovered within the fort at the top (I still remember pondering why, what was it doing up here !). The discovery in the 19th century of 30 such carved bull stones from the harbour of Burghead, in close proximity to Burghead Pictish fort and remarkable subterranean well, is also highly evocative of the complex relationships to different kinds of place in the past. So I was reminded that Pictish symbols on stone, had been deployed across all areas of the landscape from fortified hilltop, close to lowland settlement, in coastal cave and deposited in the sea. I had not appreciated, that as well as the permanent collection at the National Museum of Scotland (NMS), there is currently a temporary exhibition Creative Spirit. 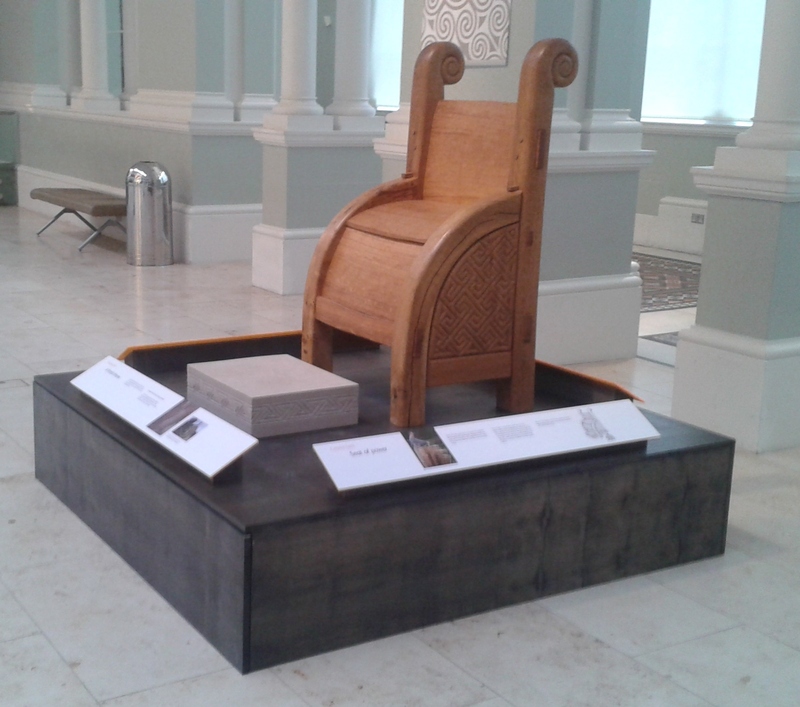 A wonderful example of artists and craftspeople being inspired to ‘create again’. This fantastic project has explored how artist and craftspeople can be informed by past objects but reinterpret them in new ways. There are some great insights into this process of ‘Bringing the Past to Life‘ on the project website in relation to the wooden Pictish throne, Pictish drinking horns, early Medieval bells and the Loch Glashan leather satchel. 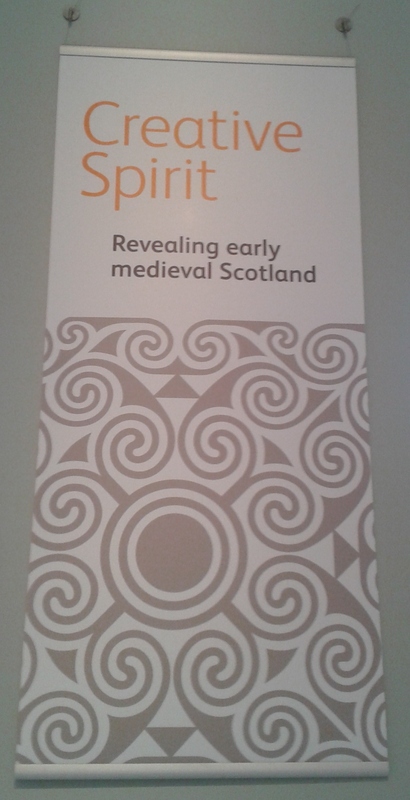 Also amongst the exhibition was portion of a hoard found in Fife, not far from East Wemyss Caves. The Norrie’s Law hoard, is the largest ever hoard of Pictish Silver, and was found in 1819 from the top of a Bronze Age burial mound. When discovered the hoard was largely plundered and dispersed, but the surviving portion is still remarkable for the quality of craft displayed. 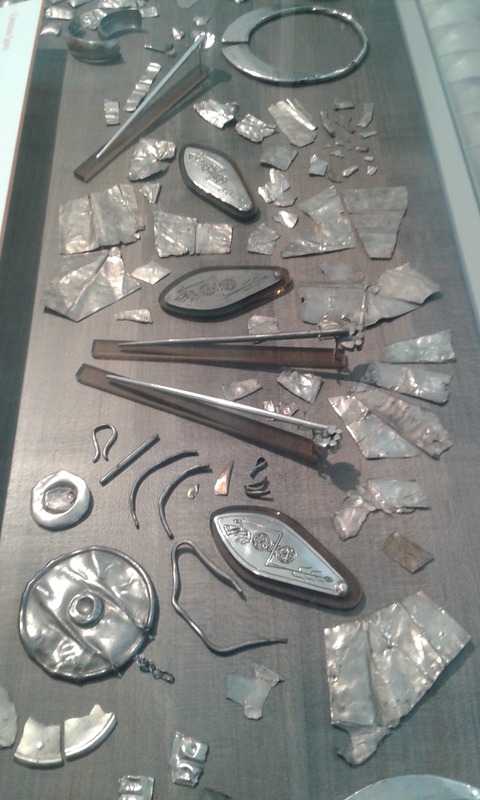 Intriguingly in 1839, 20 years after its discovery, a silversmith was commissioned to produce pewter replicas of the pieces by antiquarian George Buist: in hope seeing them would encourage people to provide information on the missing pieces. A silver hand pin and plaque, apparently from the looted hoard of 1819, were then handed in to him. However recent analysis by X-Ray Fluorescence (XRF) has shown these were made from silver so pure they had to date from the 19th century: they were fakes ! Now there is further use of technology by NMS to better understand and piece together the fragments of the past. With the emergence of new forms of digital heritage, the copies of past sites and objects we can now make can be explored and manipulated in a remarkable range of ways. For example, the remains of the face of the Hilton of Cadboll stone, which was chipped to pieces in the 17th century, were excavated and have been digitized. You can spend hours on the Pictish Puzzle from the NMS in an attempt to establish how it may have looked originally. 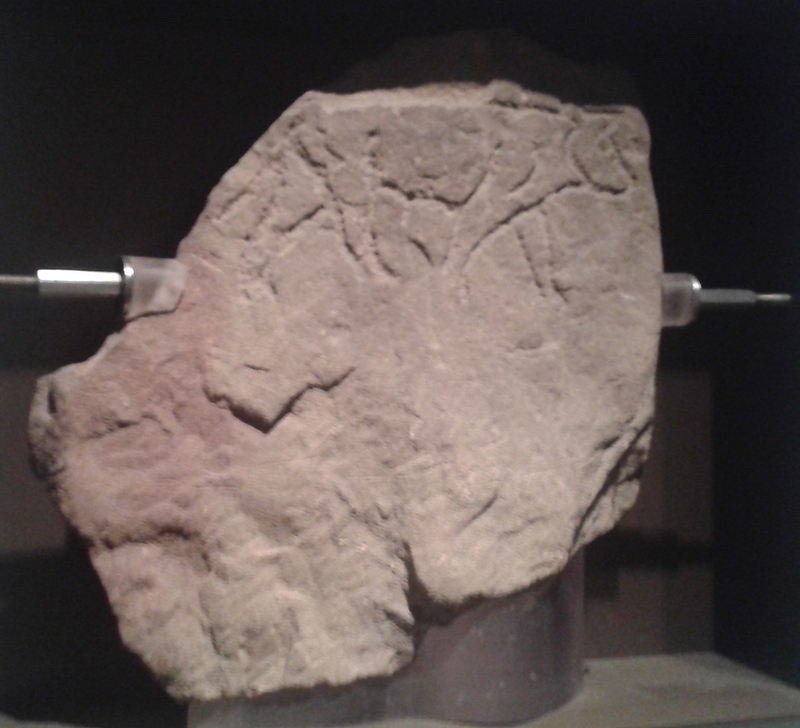 Yet even as I was leaving the museum I encountered another example of the Power of the Picts. A series of prints by Leslie Reid of Pictish symbols, which are created by carving replicas in sandstone then rubbed with handmade beeswax crayons onto calico cotton. 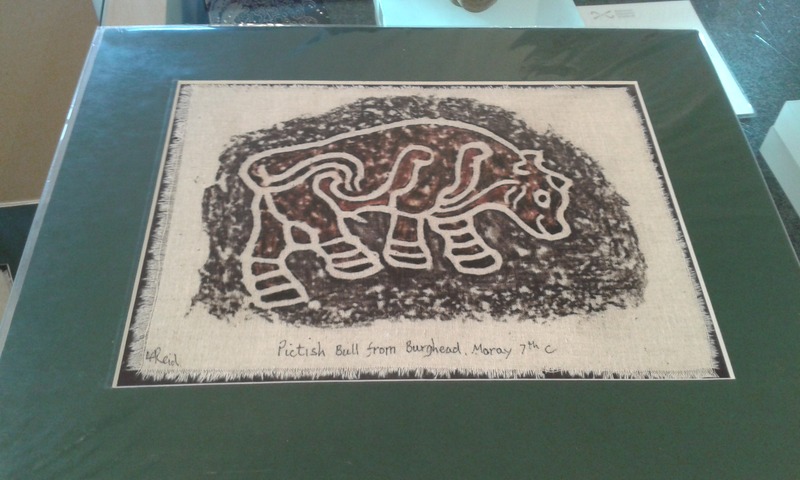 I am sure I have only encountered, and mentioned in this blog, a small proportion of the artists and craftspeople whose work is inspired by the legacy of the Picts. It is clear from archaeological evidence that the Picts were aware of, related to and evoked a more ancient past through their practices. From what I encountered, there is still a remarkable Power of the Picts in continuing an ongoing conversation through art and craft about our relationships with past and place ! 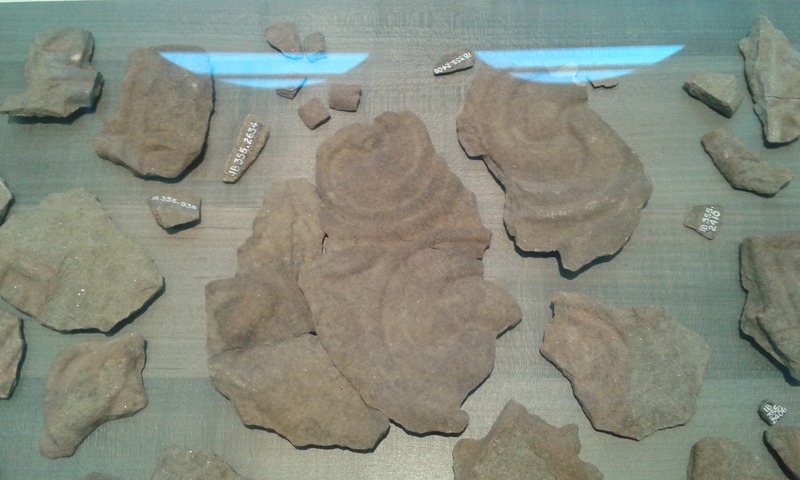 appears on the interpretative signage for the Moy symbol stone in the National Museum of Scotland, referring perhaps in part to the huge debate about what individual symbols may ‘represent’ and whether they had been combined in some form of grammar. 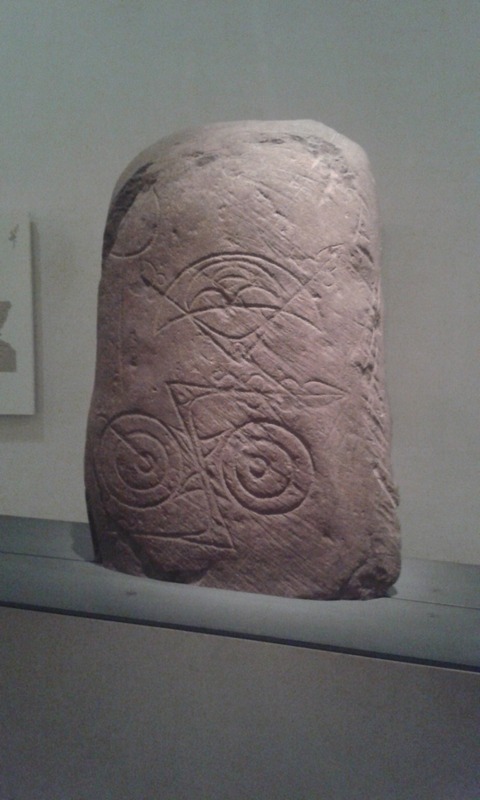 More information about Pictish Stones can be found here as can some three dimensional models of The Maiden Stone , Sueno’s Stone , Aberlemno Stone , Cossans Stone and The Duplin Cross. 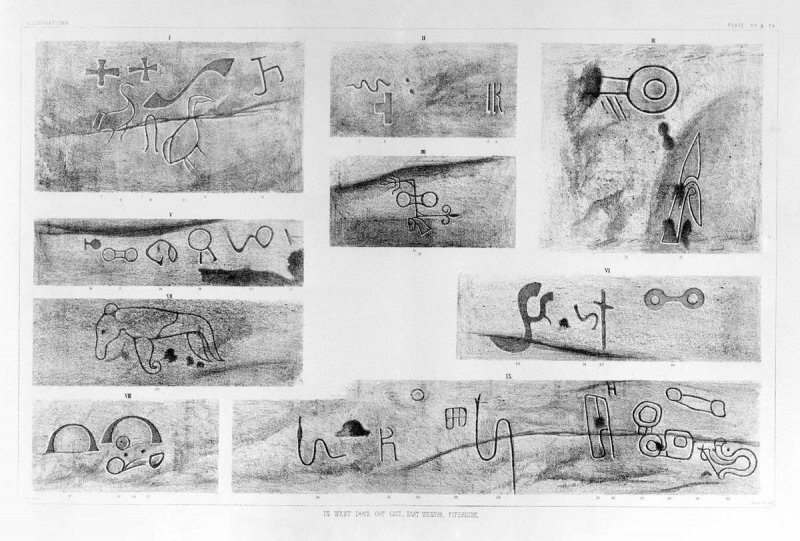 The illustration of the Doo Cave Carvings originates from Stuart, J 1867 Sculptured Stones of Scotland v2, Plate 33 & 34. Edinburgh but displayed on the RCAHMS CANMORE entry for the site. 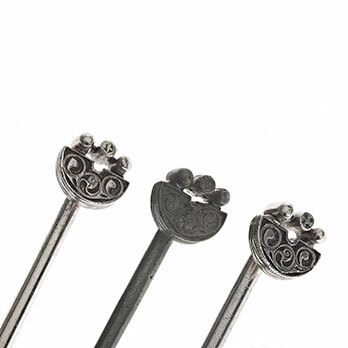 The picture of the three Norrie’s Law ‘Pictish’ pins is from the National Museum of Scotland Creative Spirit website. A few months ago while driving along the M90 in Fife the car nearly left the road…! It was because I was so surprised at spotting massive earthworks from the motorway where last time I had driven passed there was a surface coal mine. I later established it was the land restoration project Scottish World following opencast coal mining at St Ninians Mine. As opposed to restoring the land to forestry or agriculture Fife Council has given planning consent to create a major land art project. The first phase of the project is due to be completed by 2014 but there are animations of how the whole site is visualized at the client website, Scottish Resource Group. The site has been designed by artist Charles Jencks. There is some good information at the Education Scotland portal Marks on the Landscape about the concept and design process and the practice of ‘land forming’. It also includes an interesting set of photos of the changing use from coal extraction through ‘landforming’ to emerging land art at St Ninians mine. Further marks on the land are currently being made at a second restoration project of an opencast coal mining site in Scotland, Crawick Artland. The process of design and construction at Crawick Artland will have a first phase of major works, with marking out having taken place in May 2012, and in a second phase other artists will respond to the site producing further elements. It is interesting that there are two major regeneration projects in Scotland, both with the same artist, and a third recently opened in Northumberland. In each case there is an aspiration to create new open and green space, establish hubs of cultural and social activity, bring health benefits, and increase economic activity by attracting tourists: rather than land art, perhaps what is being created are multi-functional places? I wonder if this is the start of a growing trend towards more ambitious / imaginative land art / restoration projects? I am not sure whether there have been any design competitions for these sites and what designs others would have produced. In future, should communities who live closest to such sites have the responsibility for conceiving and designing such places? Clearly with their scale such art interventions will be features in the landscape for centuries, I wonder how they will be viewed by subsequent generations…?